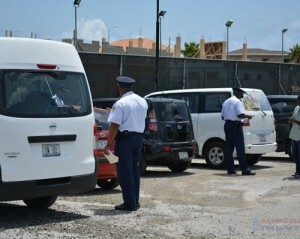 WILLEMSTAD - The police set up various traffic checkpoints today in different places in Willemstad. Motorists were checked if they were wearing their seat belts and whether they have paid their vehicle tax and insurance. Police also inspect the vehicles for technical defects. The checkpoints started around 12:00 this afternoon at the Koraalspechtweg. Up to now, there has been one car chase. Furthermore, there are still no remarkable situations. The police will, during the course of the day, move to other places in the city.